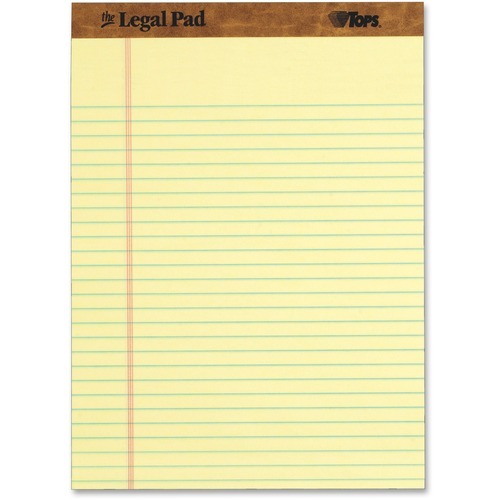 Tops The Legal Pad Ruled Top Perforated Pad - 50 Sheet - 16lb - 8.5\" x 11.75\" - 12 / Dozen - Canary Media - Welcome to TABS! Quality writing pads feature double-stitched leatherette binding at the top and a sturdy, 30 point chipboard back. 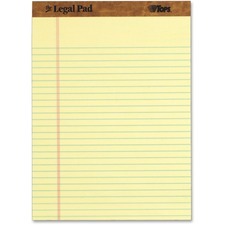 Each sheet is perforated and legal/wide-ruled with 11/32\" line spacings and a 1-1/4\" left margin. Each pad contains 50 sheets of 16 lb. Quality writing pads feature double-stitched leatherette binding at the top and a sturdy, 30 point chipboard back. Each sheet is perforated and legal/wide-ruled with 11/32\" line spacings and a 1-1/4\" left margin. Each pad contains 50 sheets of 16 lb. paper. Margin: 1.25" From Left Margin Left Space: 1.25"
Sheet Quantity: 50 Sheet Sheet Size: 8.50" x 11.75" 8 1/2" x 11 3/4"